These past few weeks we have been feeling a little homesick. We've been having lots of fun keeping ourselves busy here in Florida but we've just had those extra little aches for home and missing family. There isn't a day that goes by where we don't speak to, at least, our little sister (Jen) and we hate going more than a few days without speaking to our Mum. Now none of our family, except for our brother Chris, have Facebook, Twitter, Instagram or Snap chat. So there's no quick Facebook messages, seeing what they are eating via Instagram or Tweeting something funny to Jen every few minutes going on here. No sirree! 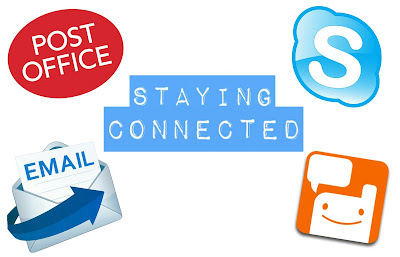 However, thanks to the the many different apps now available, as well as good old fashioned snail mail, we still manage to stay connected. Here are our favourite ways to do so. Where would we be without Skype? Curled up in a ball somewhere wishing we had ruby slippers to take us home, that's where!! Seriously as great as it is to hear messages and pick up the phone, if we had to go months on end without seeing our families faces, we wouldn't have survived out here this long. Jen will often send us messages on Voxer from our Nanna and Grandad, but having Sunday morning Skype sessions with them, where we can actually show them our apartments, Italian treats we have found and see them smile, is honestly priceless. We try and find time as often as we can to properly sit and talk with Jen, and whoever else is home at the time, for a good hour or so. Sometimes we don't even have much to say but just seeing their faces is enough to put smiles on ours for the rest of the day. So when we're done sending our ten minute voxers, have already sent a letter in the post and had our weekly Skype chats and yet there's still more to say, we decide to write emails to mainly Dad, Jen and Chris.This way we can express lots of thoughts and opinions and know that they can take their time to read it and reply when they get a moment. We don't do this as often as we used to, but it's still an awesome option when we have lots to say but know Jen won't be able to listen to said ten minute voxer at work or we don't want to wait the few days it takes for post to arrive! 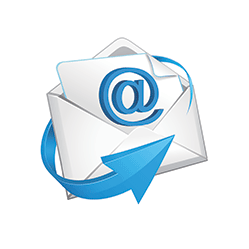 Plus isn't it nice to have an email in your inbox that you actually want to read? So much spam these days!